In thick side of each chicken breast, cut 3-inch-long pocket to within 1/4 inch of opposite side of breast. For each breast, cut 1 slice of cheese in half, and add to pocket; cut 1 slice ham in half, and add to pocket. Secure with toothpicks. In small bowl, mix 1 tablespoon of the mustard, the Worcestershire sauce and smoked paprika. Brush chicken breasts with Dijon mixture. In medium bowl, mix remaining 1 tablespoon mustard, the melted butter, salt and pepper. Add potatoes, and toss to coat. 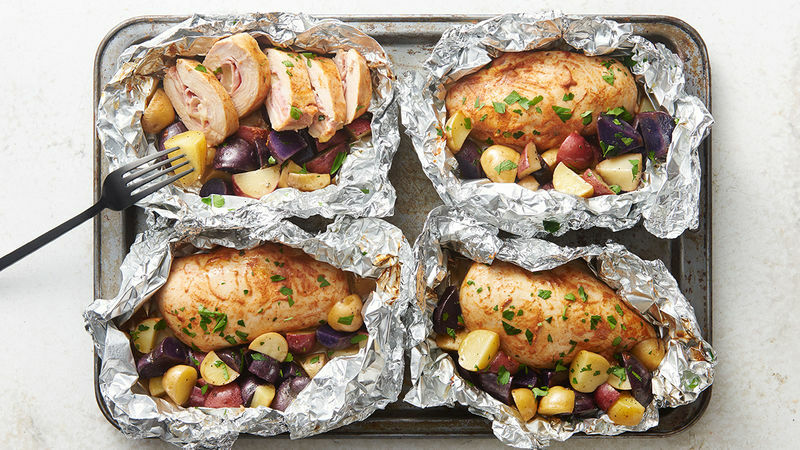 Place chicken on center of each sheet of foil. Spoon potato mixture equally around each chicken breast. Place packs on grill over medium heat. Cover grill; cook 12 minutes. Rotate packs 1/2 turn; cook 9 to 11 minutes longer or until potatoes are tender and juice of chicken is clear when center of thickest part is cut (at least 165°F). Remove packs from grill; cut large X across top of each pack. Carefully fold back foil, and garnish with parsley. To make in oven, place packs on cookie sheet. Bake at 375°F 30 to 35 minutes or until potatoes are tender and juice of chicken is clear when center of thickest part is cut (at least 165°F); garnish with parsley. To make the pockets in the chicken breasts, use a small paring knife for better control. Make sure all the filling stays inside, where it belongs. Stuff cheese in pocket before adding ham so the ham blocks the exit.